Electronic, mains – independent meters to acquire water consumption in autonomous domestic water plants. Can be retrofitted to stop valves that have already been installed. Storage and display of the cumulated consumption values on a selectable set day. Available as Valve meter compact version. Nominal flow rates of Valve and Bath tub meters 1,5 m³/h. 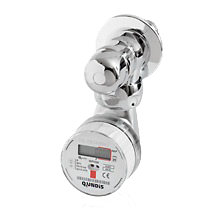 The electronic Valve and Bath tub meter is a component of the Q AMR system and can be read out or programmed via and IrDA interface.